BPM Tap Tempo - A tap tempo and BPM calculator for delay and LFO rates. 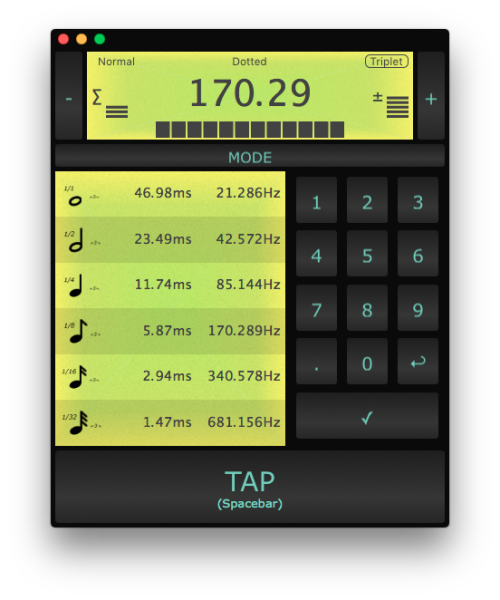 A tap tempo and BPM delay time/LFO rate calculator, all rolled into one handy application. Want to know the tempo of a song? Tap your finger on the big friendly tap button in time with the music and the tempo will display at the top. Got a delay effect on your pedal/synth/effects rack? Accurate delay times are already on the screen for you to use. Got a LFO parameter on your effect or synth patch? The LFO rates are also on screen to set the effect in time with the track. Tap in time with any music to find the tempo, correct delay times and LFO frequencies. Hit the mode button to change the delay and LFO display to dotted or triplet time. BPM can be adjusted manually if you already know the tempo and just need the delay/LFO rates.